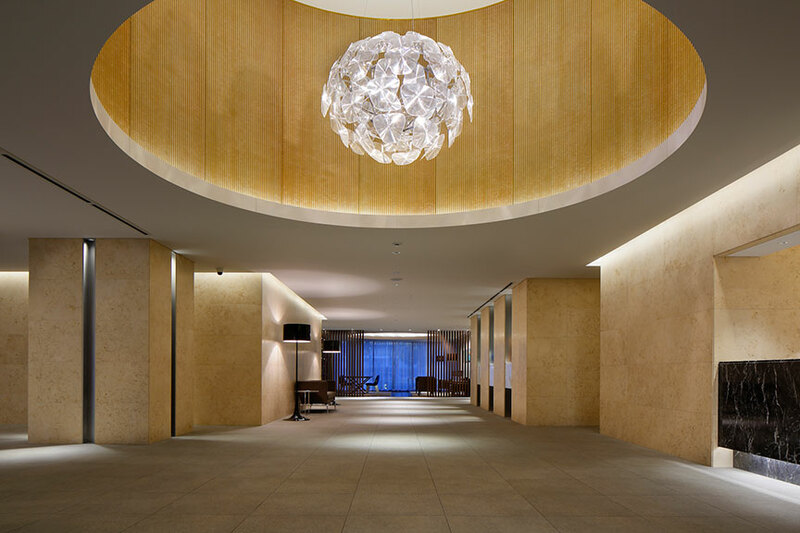 BRANZ TOWER Minatomirai – Jun Mitsui & Associates Inc. Architects｜Pelli Clarke Pelli Architects Japan, Inc.
BRANZ TOWER Minatomirai is a housing complex constructed as part of the mixed-use development project in the highly visible center of Minatomirai 21. We were in charge of supervising the design of the exterior and entrance of this housing complex. 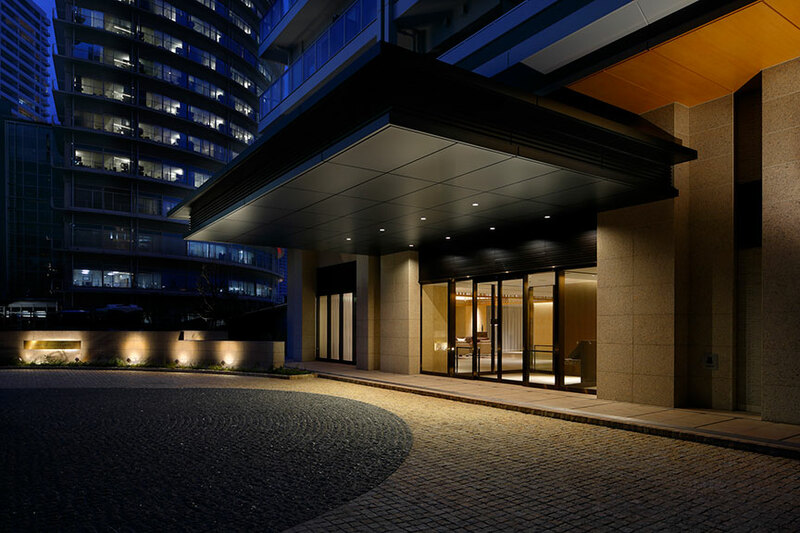 In keeping with the Minatomirai area, we have designed a “residence for mature people,” incorporating the concept of the mixed-use development, namely, a “refreshing and lively atmosphere,” to our design. The exterior design highlights parallel lines at the lower levels to create a distinctive residential quality. The wood-patterned eaves of the stylobate warmly welcome residents, while the entrance canopy that jetties out to a distance of seven meters accentuates the powerful dignity of the complex. For the exterior and entrance, various colors are linked and different materials, such as stones and bricks, are arranged to produce an integrated and dignified impression. 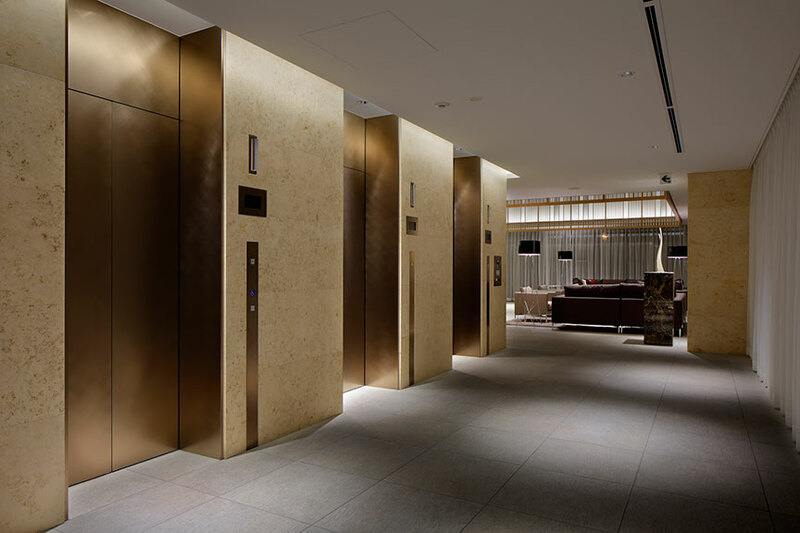 In contrast to the large-scale townscape and landscape of Minatomirai, the interior features an elaborate design to create a common space that evokes feelings of warmth and relief in residents upon their return home. 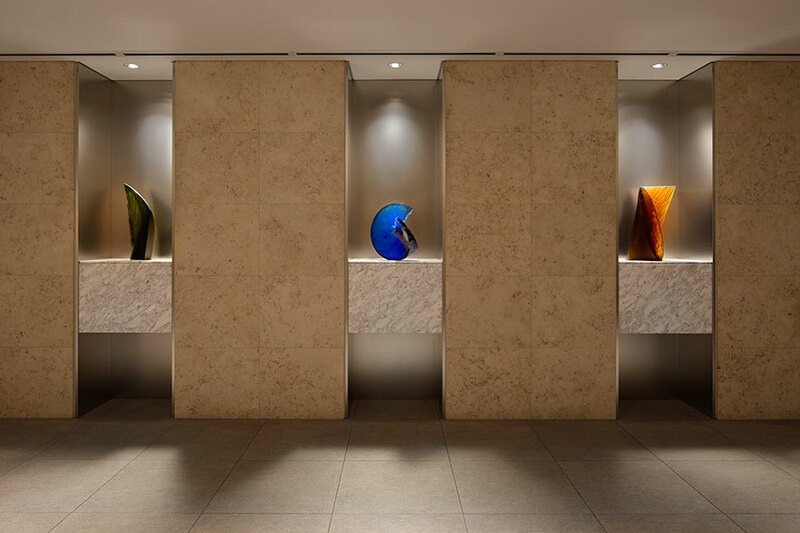 The natural texture and look of limestone and wood are used to give variety to the details for a richly diversified spatial representation. A chandelier hung in the circular well above the entrance is surrounded by fine and soft fabric-like metal, which accentuates the sparkle of the chandelier. Furthermore, wood-patterned louvers that conjure up images of trees in the woods are installed in the upper part of the square-shaped main lounge. 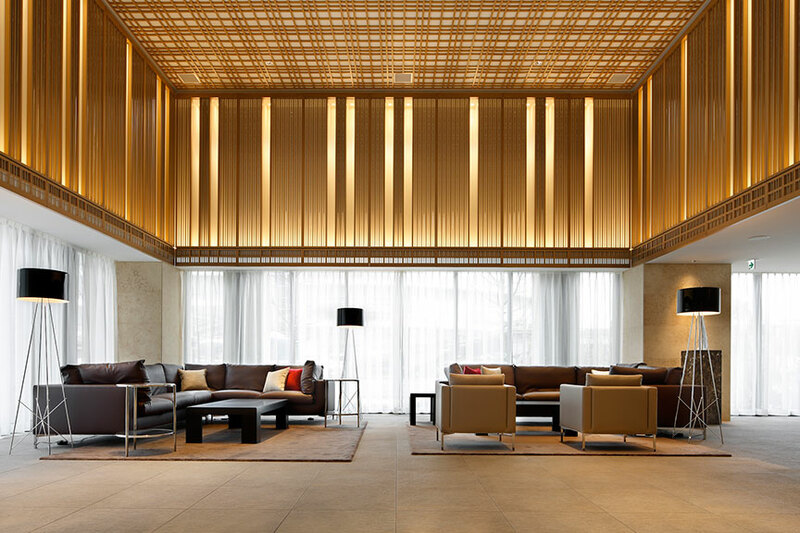 The design of the latticework louvers was inspired by the light that enters through a shoji screen to create a linkage with the trees in the planted area seen from the bottom part of the lounge. 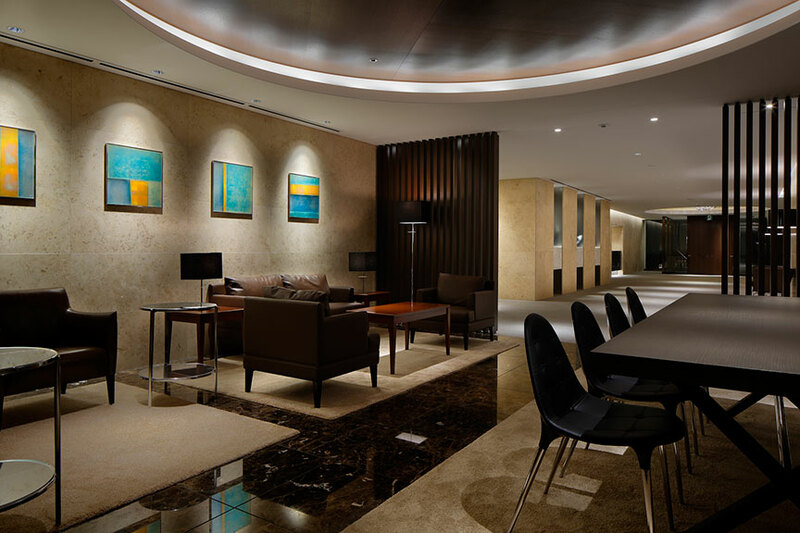 By skillfully controlling various types of light, we have successfully created an entrance with a delicate and refined atmosphere.